Cortical actin comprises a dynamic array of single actin microfilaments that interacts with the plasma membrane of most plant cells. These interactions, mediated by as yet unknown actin-binding proteins, may function to anchor the entire actin cytoskeleton, and contribute to cell signaling. In cells elongating by diffuse growth, cortical actin is typically transversely oriented, parallel to microtubules. 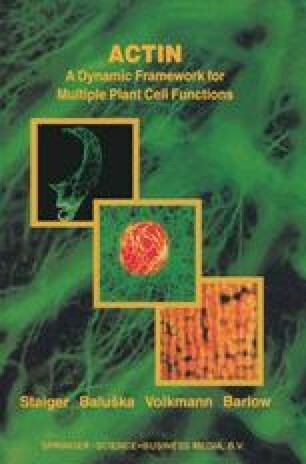 Drug studies demonstrate that in some cases, cortical actin is necessary for the precise re-arrangements of cortical microtubules that control cell expansion and plant morphogenesis. However, in other cases, cortical actin depends on the cortical microtubules for its organization. This suggests that the cortical cytoskeleton is a closely controlled system involving feedback between actin and microtubules.